After five days of poker action at Crown Perth in Western Australia, the victor of the third stop on Season 5 of the Australia New Zealand Poker Tour has been decided. For the rest of time the history books will say that Dejan Divkovic claimed the 2013 ANZPT Perth Main Event title and $114,000 to go along with it. At the beginning of the day there were four players with relatively short stacks compared to the rest of the table. However, with the blinds starting at 3,000-6,000 with a 1,000 ante, and the average stack at over 70 big blinds, every player had plenty of time to run their stack up. It would take half an hour of stagnant play before the first all-in, with David Fragomeni the eventual player to find the rail in 9th place. Fragomeni’s final hand saw him three-bet all-in from the cut-off holding , only to run into the of David Evans. The dealer spread out a board, with no help for Fragomeni meaning he had found the rail. The next player to be eliminated was Luke Brabin. During Level 18, with blinds at 4,000-8,000, Iori Yogo opened the pot to 16,000 from the cutoff. Brabin called out of the big blind and the dealer turned over a flop. At this point Brabin check-shoved for 116,000 after Yogo led for 22,000. Yogo made the call, putting Brabin at risk. Brabin held and was not in good shape against Yogo’s and when a turn and a river completed the board, it was all over in 8th place for Brabin. Not long after Brabin’s elimination and James Broom would be joining him on the rail. Despite doubling up early and staying active enough to run up a bit of a stack, Broom’s final hand would eventually occur. Broom opened the hijack to 16,000. Dejan Divkovic was in the big blind and called as the dealer turned over a flop. Divkovic check-called a bet of 17,000 here and then checked the turn. This time when Divkovic checked and Broom bet 31,000, Divkovic would check-raise to 100,000. Broom called and a completed the board on the river. Divkovic took his time before betting 175,000 – enough to put Broom all in. Broom made a reluctant call and turned over for flopped two pair, which wasn’t good enough for Divkovic’s for a turned straight. There was a bit of a lull in the play following Broom’s elimination, but the action would pick up during level 19 with the blinds at 5,000-10,000. Beginning with an open to 20,000 from Divkovic from under the gun, Colin Wilford called out of the small blind and so too did Philip Gidley-King from the big blind. The flop would see Wilford check and Gidley-King bet 20,000. Both Divkovic and Wilford called and a hit the turn. This time the action was checked to Divkovic, who bet 65,000. Wilford moved all in for 155,000 and Gidley-King folded. Back on Divkovic and after some thought, he made the call, holding . Wilford was behind with his and the on the river changed nothing and with that Wilford was sent home in 6th place, collecting $23,000 for his time. the turn or the river, it was all over in 5th place for a $27,300 score. Heading into four-handed play and the remaining players had an average stack of around 100 big blinds. The shortest stack at this stage was Philip Gidley-King and it was no surprise to see him getting all his chips in the middle when he held on a flop. Gidley-King’s opponent was Yogo, who had flopped a set with his . Gidley-King hit his flush on the turn, but the board paired up on the river and with that Gidley-King was sent home in 4th place. Dale Marsland had been the short stack for much of his last few orbits and understandably got all his chips in the middle when he woke up with in the big blind. Marsland had to come up against the of Iori Yogo and despite having a tonne of outs on the turn of a board, the on the river meant that Marsland would be going home in 3rd place. With two players remaining it was the first time an ANZPT final table would have two nationalities from outside of Australia or New Zealand represented in the heads-up battle. It was Divkovic, from Bosnia, who held a slight chip lead over Japan’s Yogo. But it wouldn’t stay that way for long. Shortly into heads-up play and Divkovic would leave Yogo crippled. Divkovic held an almost 10-1 chip lead at this point, but after a quick double up, Yogo would still have around 50 big blinds in his stack. It was looking like Yogo was going to claw his way back into contention, but inevitably the final hand of the tournament would play out and Yogo would find himself on the rail in 2nd place, collecting $72,000, while Divkovic was our champion. A big congratulations to Dejan Divkovic for becoming the Season 5 ANZPT Perth champion. For that effort, Divkovic takes home $114,000 and all the glory that goes along with an ANZPT title. Thanks to all the team here at Crown Perth in Western Australia and to the crew at PokerStars for another superb event. Be sure to join us in Sydney for the next ANZPT this coming March! Iori Yogo Eliminated in 2nd Place ($72,000), Dejan Divkovic Wins! 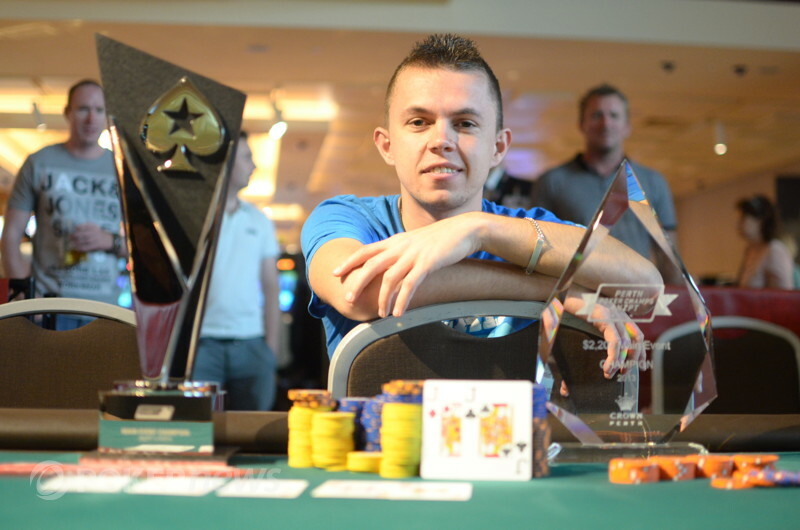 The final hand of the ANZPT Perth Main Event has just been run and won by Dejan Divkovic. It started with Divkovic opening the button to 35,000. Iori Yogo called and a flop was slammed on the felt. Yogo check-called a bet of 35,000 and a hit the turn. Yogo again checked and Divkovic bet 76,000. Back on Yogo and he made it 250,000 to go. Divkovic slowly made the call and the dealer completed the board with a on the river. Yogo moved all in for 580,000 here and Divkovic thought for a while before making the call. "You win," said Yogo as he turned over for nothing but a busted flush and nine-high. Yogo wasn't wrong, with Divkovic's the hand that would see him claim the title. For his effort, Japan's Yogo goes home with a very handy $72,000. Iori Yogo has just quickly doubled following the recent hand that left him crippled. All the chips were in preflop, with Yogo opening the button and Dejan Divkovic shoving from the big blind. Yogo called and the two players turned their hands over. Yogo was looking great to double up and it stayed that way as a board meant that Yogo was back up to a respectable stack of over 800,000. Dejan Divkovic is now holding a massive chip lead thanks to a bit of a cooler and some raw aggression from Iori Yogo. Divkovic started the hand with the button and raised it up to 35,000. Yogo three bet to 100,000 and Divkovic made the call. Yogo led for 150,000 and Divkovic raised it to 375,000. Back on Yogo and he thought for a long time before moving all in - having Divkovic covered after recently winning multiple small pots. Divkovic instantly called all in and tabled his for a flopped set. Yogo turned over his , with the open-ended straight draw meaning Divkovic had to dodge some cards. The was safe for Divkovic and so too was the and with that, Divkovic had raked in the monster pot. Despite losing the majority of his chips, Yogo's 455,000-chip stack is still good for around 30 big blinds. The two players are back from their break and the heads-up battle has commenced. As you can see it is Dejan Divkovic who holds a lead over Iori Yogo. Following the elimination of Dale Marsland, the two remaining players have been sent on a 10-minute break. The heads-up battle will begin when the players return. Dale Marsland has been the short stack for much of the last few orbits and understandably got all his chips in the middle when he woke up with in the big blind. Marsland had to come up against the of Iori Yogo and despite having a tonne of outs on the turn of a board, the on the river meant that Marsland would be going home in 3rd place. A great effort from Marsland as he adds another $41,000 to his seemingly ever-growing resume of poker results. Iori Yogo was in the small blind when he raised it up to 35,000. Philip Gidley-King made the call from the big blind. It was on the flop that all the action would heat up. It started with Yogo leading for 40,000. Gidley-King then moved all in for 132,000. Yogo snap-called and the two players turned their hands over. The rail called for a diamond and that's what they got on the turn. Gidley-King was in front at this point but would unfortunately be disappointing to watch the on the river pair the board to give Yogo the full house. A great effort from Gidley-King, he goes home with $32,800 for his time.